Beautifully restored traditional cortijo, stone built with wooden beams and cane roofs. Set in a lovely south facing garden, amongst olive and orange orchards with patio swimming pool and bbq. Free internet connection. Kitchen/sitting room. Lounge/TV room. Bathroom and utility room. I live in Portugal with my partner, 2 horses, dog & cats. I am half Spanish We lived in Spain on & off for various years Although we love Orgiva & our cortijo there is very special. We decided to make a change - so we bought a derelict farm, which we are renovating. Lots of hard work, lots of challenges, new landscape,new language - we´re lovin´it! We found " Las Alpujarras" almost by accident, while travelling through Spain. We feel in love with amazing mountain views instantly. We decided to buy the property in 1987. There wasn´t much of the original building still standing, in fact it had been derelict for more than 20 years, leaving only an idea of how it must have been before. The building is over 100 years old. My partner & I spent the previous years renovating the building. We have tried to keep as many of the original features as possible. Stone walls, wooden beamed & cane ceilings. We have built it in a traditional style using local materials for construction & decoration. We have designed the interior to be modern & comfortable with an unusual & unique decor. It has been described as a "fairytale house." The cortijo is situated in a scenic area, situated amongst olive & orange groves with mountain views all around. The lively town of Orgiva is only 5 minutes by car or an easy 15 minutes walk. The property is very unusual as it is such a traditional old building. Full of character and absolutely unique in its decor. Comfortable & fully equipped, even music system with speakers in most rooms & outside - great for relaxing. Kitchen/sitting room with open fireplace. Tiled work surfaces and ceramic sinks. Electric oven, gas hob and extractor. Microwave, Dishwasher, fridge/freezer, toaster, juicer, kettle. Just returned from a month long stay at Cortijo Tanya. We can only agree with the other excellent reviews. It is a quirky and rustic retreat that we came to love. The house has everything you could need and is surprisingly spacious. Most of all however we absolutely loved the outside space and spent most of our time there. It was a real treat to pick oranges every morning for our juice, and the views were stunning. Origiva itself may not be everyone's cup of tea but we found it really interesting and enjoyed having coffee in the morning in the square and watching the world go by. All in all highly recommended, we had a great time which we hope to repeat at some point. Great that you liked our place. It is fairly unique & very special. 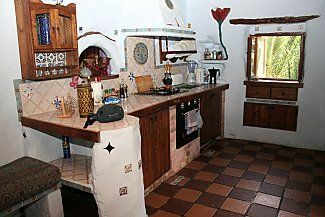 This is a lovely country cottage, spacious and well equipped with lush garden and great outdoor space and pool. A couple of issues for us were the parking which was on road in a narrow country lane - the pathway to the cottage is very steep and unsuitable for parking and the fact that the pathway was used by others (we assume the people who look after the property) which impinged on privacy. A lady was at the property cleaning the pool and watering the garden one evening when we arrived home and it would be helpful if we had been told when she would be doing this as all we wanted was to jump in the pool after a hot day out in Granada. She also arrived at 9.00 am on the morning of our departure and started using the strimmer in the orchard despite checkout being 11.00 am. We were in fact loading the car which made us think she may have been watching. Overall it was a very relaxing place, well located for exploring the local mountain villages and day trips to Granada. It was great to be able to pick fresh oranges for juice every morning. Apologies if Mari our gardener & pool maintainer turned up at house whilst you were in Granada. She is always very unobtrusive & trys to do any maintenance when guests are out. Regarding parking in the lane. There is enough space & no security issues. Ourselves & guests have parked there for many years. This is a peaceful cortijo located in a small piece of paradise. We visited mid-May. Comfortable, quirky accommodation kitted out with everything we needed, a nice little pool to cool down in, surrounded by wonderful views and orange and lemon groves. Orjiva is a 15 to 20 minute uphill walk away and the cortejo is accessed up a steepish ramp, so you probably wouldn't consider this property if you had walking difficulties. There's nothing twee about the town itself. It has a nice plaza, a couple of good restaurants and plenty of bars to choose from and several supermarkets and fruit and veg shops. For us a week was not long enough and we will definitely return. Glad you liked the piece of paradise. fantastic location we loved it! Quirky, lovely hideaway in gorgeous surroundings. We will be back! Malaga 2 hours. Car hire is recommended. 15 minutes walk and 5 minutes by car to Orgiva. Tarmac track. There are plenty of shops, banks, bar restaurants, cafes even an Internet café & a weekly market. Easy driving distance to the coast, where there are many beaches, shops & attractions & the historic city of Granada, with the famous Alhambra palace & Moorish architecture. Also many interesting places to discover. Special price: 12th October - 3rd November£275 for 7 nights Reduced by £90 p/wk due to cancellation & date soon approaching * 3 night bookings ( a £35 cleaning surcharge charged uon top of quoted price) Booking Notes; Contact owner: Tanya Mimmack. Non returnable deposit of 25% required for booking confirmation. Balance to be paid 6 weeks before booking date. Can be paid via secure online booking Prices are for the property per week/nightly in UK Pounds. Long lets available IF YOU APPEAR TO HAVE NOT RECEIVED A REPLY TO YOUR ENQUIRY, PLEASE CHECK YOUR SPAM MAIL FOLDER. THANKS Changeover Day: Flexible arrival date 3pm. Departure 11am.